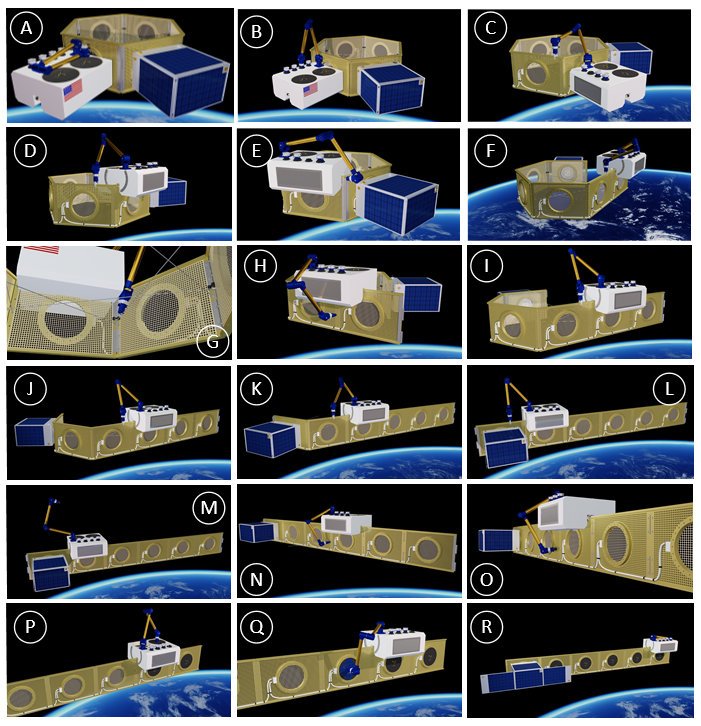 The EAGLE (External Augmentation of Generic Launch Elements) system is comprised of several separate proven technologies that are combined into one cohesive apparatus. The system incorporates a robotic manipulator, various end effectors for grasping and joining, integral stowage for sensitive components, and a traverse mechanism. This enables EAGLE to conduct robotic disassembly and reconfiguration during the transformation of the ESPA Ring into the phased array in less than 90 minutes. EAGLE is the size of a small satellite and may be stowed on a traditional ESPA satellite deployment site for launch. The EAGLE system may also be stowed within the ESPA Ring to make additional deployer locations available. Made In Space leads a team including industry veterans from Moog CSA Engineering, Harris Corporation, and Oceaneering Space Systems to develop the EAGLE System, an innovative capability that rapidly deconstructs launch hardware and reassembles the components into a robust support structure for science instruments. 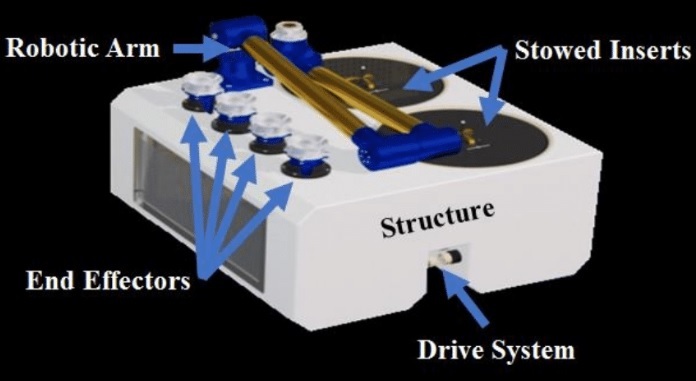 The EAGLE System integrates multiple proven, space-compatible technologies into a single utility to facilitate the conversion of an Evolved Expendable Launch Vehicle (EELV) Secondary Payload Adapter (ESPA) or other launch adapter structure into an instrument support platform attached to a hosted payload bus. EAGLE reconfigures a hexagonal ESPA ring into a large phased array antenna for a small satellite bus within hours of launch. 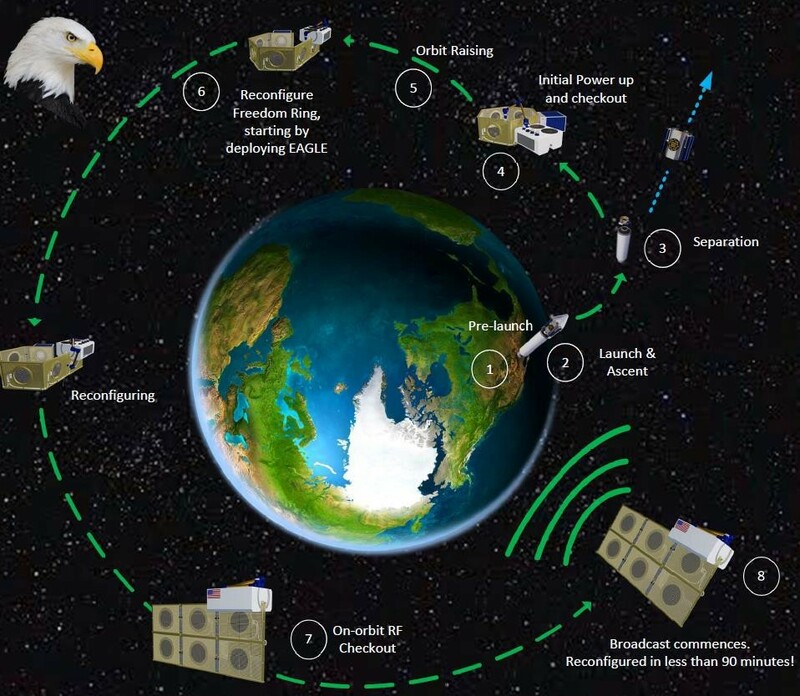 EAGLE includes a specially designed ESPA ring configured to support the traditional ESPA ring function during launch and initial deployment and then be rearranged on orbit to produce a phased array. This is only a single type of mission that can be constructed with this technology by repurposing launched equipment which is typically classified as debris after launch. The ESPA ring can be outfitted to serve as a structural support for interferometry missions, an in-space manufacturing platform, solar arrays, and more. A) the EAGLE begins with robotic arm in the stowed position. G) The tensioners used for rigidity during launch are harvested for use as welding feedstock. H) EAGLE glides along the top of the ring, planarizing the panels and tacking them in place. M) Alignment is checked using an optical verification sensor. N) EAGLE then welds the panels together into the new configuration. O) Each weld is verified at the joints with the hyperspectral sensor. Q) RF packages retrieved and placed in each of their ports. R) The completed array is ready to broadcast!